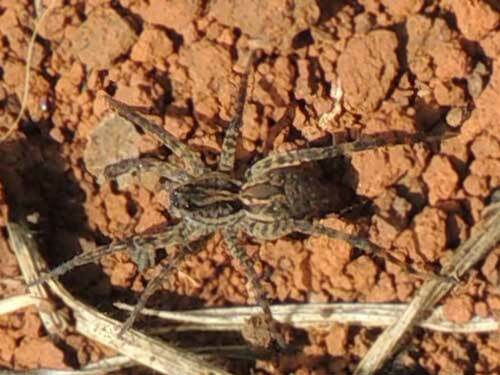 Observed in a maize field, Eldoret, Kenya. July 2014. Length, not including legs, about 10 mm. Wolf spiders have eight eyes at the anterior end of the cephalothorax, four of which are quite large. For sure these eyes are used during courtship displays and to avoid predation by birds and other insectivores. Their role in capturing prey is probably small. First these spiders are largely nocturnal hunters - they range over the soil surface at night without benefit of a web. The usual hunting method is to move a few centimeters and then stop. Highly sensitive vibration detectors on the legs will alert the now sit-and-wait predator to an approaching ground insect. Already through the vibration signature the wolf spider will have information about the size and locomotion of the potential prey (or foe). It the spot is quiet for an extended time the spider will move on to another spot and repeat. These behaviors can be readily observed if the ecologist employs a head light, because the eyes reflect back the light from the observe's light source. The specimen shown is a juvenile, perhaps less than half the adult size. It was found on the soil between maize plants. There it could be an important predator of some pest species such as crickets or lepidoptera larvae. But, wolf spiders are also taking other spiders and predatory insects as prey. The bite of large wolf spiders can be painful, but are not reported to be dangerous. Copyright Michael J. Plagens. Page created 27 October 2014.